Spring has sprung, flowers are in bloom, and the weather is almost warm enough for my favorite spring activity, a good old spring picnic under tree blossoms. Just saying the word picnic automatically sends me straight into song with a Teddy Bear Picnic, please tell me you know this song as well? I had the book with the record growing up and it just makes me smile. I have set my sights on finally getting a bike, so the search is on. Would love any recommendations for something lightweight I can use to tool around the city! Packing a few sandwiches, spreading out a great big blanket, and finishing a book is all I can think about. Be sure to pop back on Thursday for a great picnic entertaining solution I cooked up over the weekend. 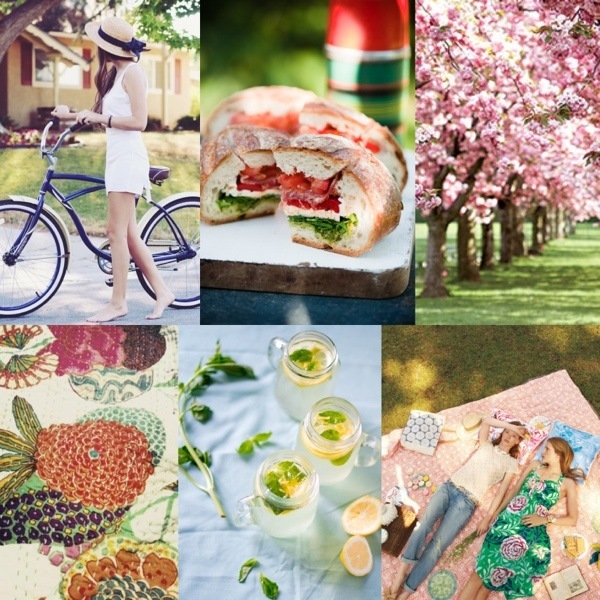 Where are some of your favorite places to picnic? Oh, and Happy Monday, I will be pretending it’s Friday all week long. Get a bike!! I want one too!! ..nice pictures!! Thanks! I just need to find a place to store it.